In and Outs are not permitted at Off The Rails Festival with the exception of VIP ticketholders. For more information on VIP tickets, click here. NO Camelbacks / Hydration packs will be allowed into the festival. Un-approved pamphlets, handouts, advertisements, etc.Skateboards, roller blades, roller skates, etc. Bags that are clear plastic and do not exceed 14” x 6” x 14” (clear, plastic tote bags are currently available for purchase at the FC Dallas Team Store). Small clutch purses or crossbody bags (with or without straps) that are no larger than 5.5” x 8.5”. One gallon clear plastic freezer bags. 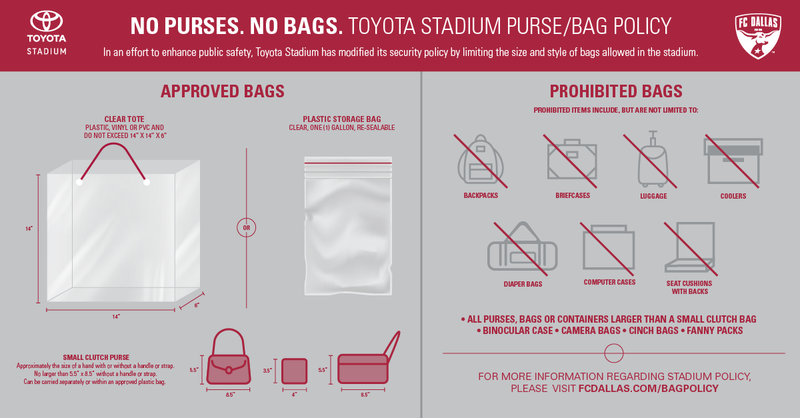 Credentialed media and staff, team personnel and credentialed guests will not be subject to the bag restrictions but will continue to enter at the designated stadium checkpoints where they will be subject to screening and bag inspections. Exceptions will be made for medically-necessary items. Please email CustomerService@FCDallas.com to get special clearance for medically-necessary items.